In my last post I mentioned that I really enjoyed answering all the submitted questions for my “About Me” video. At the end of the post I mentioned there was something else in particular that I enjoyed about that interview and that I was going to expound on it in my next post. Well…this is that post. What excited me about my last interview is how deep we dived in terms of talking about life and its core principles. I was also thoroughly stimulated by the unexpected utterings and phrases that came out of my mouth. They were as unexpected as they were resonant. And they unfolded out of me as the interview flowed. I felt that in this interview, the deeper dimensions of myself came out to play along with my silly fun sides. I don`t love all conversations. But sometimes a conversation can be a magical thing. In the right state, a conversation is an outflowing of the present moment. It can be a portal for some deep truths, mysteries, and newness to express itself and evolve. Sometimes in this state I say things that are a surprise to even me. But even as I am surprised, I feel the rightness of the sentiment as it is expressed. I think I knew this before in different ways, but I had never phrased this sentiment like this before. What an astounding and freeing realisation !!! The elemental foundation of life is love. It envelopes us from the day we are born and it is available to us in every moment. What a joyous thing to know !! I can never do anything that makes me unloveable !!! BUT ….. See the follow up quote ..
Love is all around us in every moment. But it is possible to miss it. 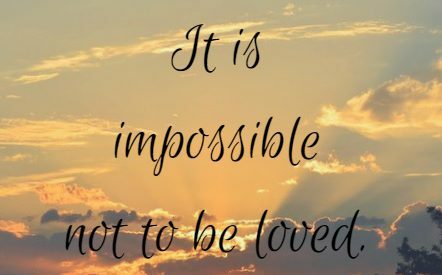 If we are feeling unloved, it is not because love is absent, but because we are making ourselves unable to perceive it through our thoughts and beliefs. We create limits for ourselves by asking for something but only being willing to accept it if it comes in a certain form or package. You cannot outrun anything in the physical world. And that is because the world is not physical….and you and the world are one. Trying to escape something outside of you is like trying to cut off a limb. At worst it is extremely painful, at best it is pointless. Transform from the inside out and you will see fear and the need to escape for what it is: an illusion. Don`t wait for life, make your life…out of the disappointments, shattered dreams and unexpected twists. You are the magician (shout out to Beyonce`s Lemonade for that line). See all the pieces of your life, and make something new out of them, make something new out of yourself. Not waiting for joy. The benefit of bringing my own joy to a situation. Through trying to approach every situation with openness and a joyful heart, I put myself in a state to always learn and and grow, even if the situation is less than ideal. I don`t wait for Joy, I bring the Joy, and I embrace everything on the journey of life. If you want to see the video, you can view it here.. Thank you again to everyone who was a part of creating this video with me. I consider it a blessing and I look forward to the future works we will create together. Till the next time <3 Ashanna .